This exhibition features 16 photographs from Wayne Levin's Akule series. Imagine seeing what you think is a coral reef, only to realize that there is movement within the shape and that it is actually a massive school of fish. That is what happened to Levin as he swam in Hawaii's Kealakekua Bay on his way to photograph dolphins. The fish he encountered were akule, the Hawaiian name for big-eyed scad. In the years that followed he developed a fascination with the beauty and synchronicity of these schools of akule, and he spent a decade photographing them. Akule have been bountiful in Hawaii for centuries. Easy to see when gathering in the shallows, the dense schools form patterns, like unfurling scrolls, then suddenly contract into a vortex before unfurling again and moving on. In his introduction to Akule (2010, Editions Limited), a collection of Levin's photos, Thomas Farber describes a photo session: "What transpired was a dance, dialogue, or courtship of and with the akule....Sometimes, for instance, he faced away from them, then slowly turned, and instead of moving away the school would...come towards him. Or, as he advanced, the school would open, forming a tunnel for him. 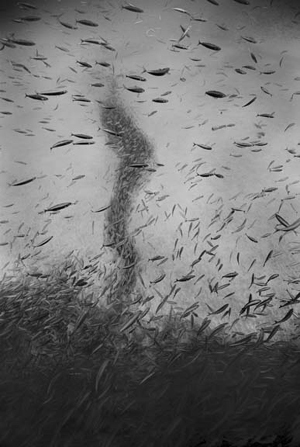 Entering, he'd be engulfed in thousands of fish." Based in Hawaii, Wayne Levin has photographed numerous aspects of the underwater world: sea life, surfers, canoe paddlers, divers, swimmers, shipwrecks, seascapes, and aquariums. After a decade of photographing fish schools, he turned from sea to sky, and flocks of birds have been his recent subject. His photographs are in the collections of the Museum of Modern Art, New York; the Museum of Photographic Arts, San Diego; The Honolulu Museum of Art; the Hawaii State Foundation on Culture and the Arts, Honolulu; and the Mariners' Museum, Newport News, Virginia. His works has been published in Aperture, American Photographer, Camera Arts, Day in the Life of Hawaii, Photo Japan, and LensWork. His books include Through a Liquid Mirror (1997, Editions Limited) and Other Oceans (2001, University of Hawaii Press). Visit his website at waynelevinimages.com.